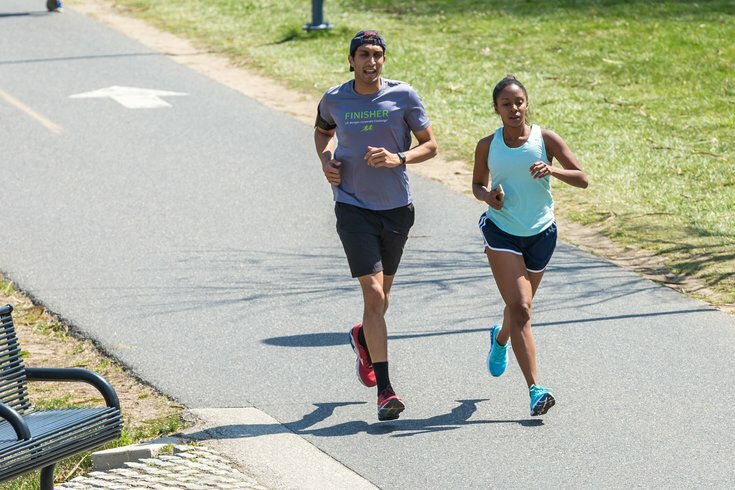 Two runners on a scenic path in Philadelphia. A recent report from the Centers for Disease Control and Prevention looked at the state-by-state breakdown of how often adults are active in their free time and, specifically, how many meet the federal government's recommendation of twice-a-week muscle training and 150 minutes of "moderate intensity" aerobic physical activity (at least). Nationally, just 22.9 percent of adults meet this minimum requirement, the CDC reported. According to individual state data, Colorado was among the most active adults with 32.5 percent meeting the CDC's exercise goals. Most other West Coast and Midwestern states have similarly above-average rates. Some exceptions – Montana (20.2 percent), North Dakota (20.2 percent), South Dakota (17.2 percent), Oklahoma (19.0 percent), and Iowa (22.2 percent) – all fall below the national average. The average exercise rates in adult Americans, state by state. 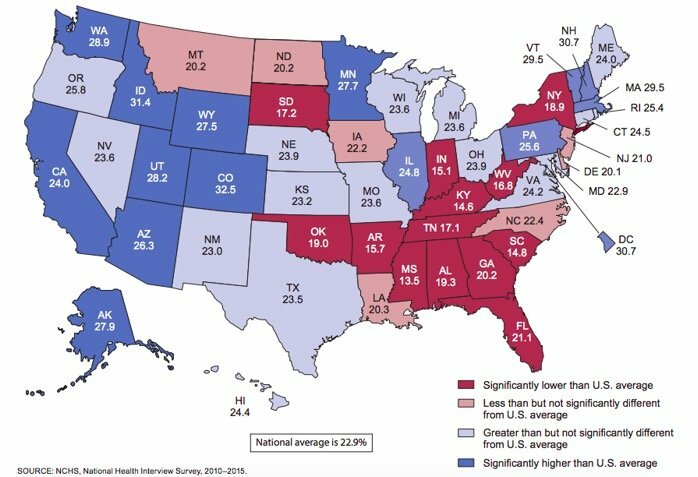 Most southeastern states from Arkansas to the coast have significantly lower-than-average exercise rates. The CDC contributes this, in part, to the lack of accessible public transit and sidewalks in the southeast, plus hot weather that can hinder the ability to exercise outside. The lowest ranking state of all is Mississippi, with an average of 13.5 percent. Though Virginia and Maryland both ranked slightly above average, at 24.2 and 22.9 percent, respectively (D.C. ranked significantly higher with 30.7 percent). Pennsylvania was one of four states on the east coast with a significantly above-average rate of 25.6 percent of adult meeting the minimum exercise goal. The three other states pull up the average are all in New England: New Hampshire, Vermont, and Massachusetts. New Jersey and Delaware did not meet the national average, falling at 21.0 and 20.1 percent, respectively. The CDC also found that employed people tend to work out more, and in general states with higher wealth showed better signs of regular aerobic activity, perhaps because of the expenses of gym memberships and workout classes.